Although the attic and crawl spaces are not popular areas of the house, they still remain important parts of the property. They not only provide storage space, but enclose the entire insulation of the building. Neglecting these key area scan become a costly experience. Infestations slowly sneak into the dark, dreary regions of the attic. Regular inspections of these areas, therefore, provide vital signs of existing and impending problems. Acting quickly cuts the extent of damage, reduces the risk of evacuation and saves you cash. Quartz Solutions is the complete answer to all your attic and crawl space demands. Be it monitoring, cleaning or up-grading, our team can handle all! Equipped with latest technology and skilled work force, we are leaders in the field. Damp and humid conditions are perfect for mold, fungus, and mildew to breed. Prolonged dampness weakens the structural foundation, rot wooden furniture and can lead to breathing disorders. 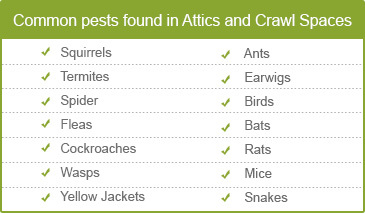 Animals like bats, mice and rodents damage cable wires and eat into things stored in the area. They leave behind a faul odord and clutter which triggers infectious diseases. Termites and white ants eat into the building foundation which requires costly repairs. Faulty and cracked ducts allow moisture to seep in. This impairs the insulation system of the building, which spikes utility bills. Meticulous inspection of the attic and crawl spaces is crucial for keeping the interiors comfortable, clean and hygienic. At Quartz Solutions we have a team of skilled professionals that is equipped and well-versed with the latest techniques in the business. Our team will carry out the detailed inspection without any charge. During the careful assessment we will test the areas for toxic gases, broken ducts and for the presence of pests and termites. Based on the findings, a systematic plan to eradicate the problems will be put forth. ‘Money saved is money earned’. We, at Quartz Solutions, follow this sentiment to the fullest. Therefore, we strive to provide the best quality services, along with expert advice and support,at the most competitive rates. Saddle Brook is a small town in Bergen County, NJ. One of the oldest municipalities in Bergen County, Saddle Brook is home to nearly 13,000 people. Spread over an area of 2.7 square-miles, the region has artistically build homes, dutiful offices, shopping zones, schools and parks. At Quartz Solutions, we wish to contribute our share to this wonderful community! 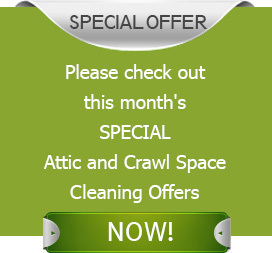 Hire us to help you keep the attic and crawl spaces of your premises in perfect condition. Call us today at 201-205-2042 for a complimentary inspection! Kudos to Josh and crew! Superior workmanship and flawless execution.